The Spain market for pharmaceutical bottles is highly fragmented with a large portion of this market being operated by a number of international players, small domestic participants, and unorganized companies. Most of the international players focus aggressively on selling their products through distributorship in order to cater to the requirements of the pharmaceutical companies and are expected to continue this practice over the forthcoming years. Gerresheimer, Amcor, and Alcion Plasticos are some of the key players functioning in this market. As per the estimations, the market for pharmaceutical bottles in Spain, which was worth US$241.4 mn in 2016, is likely to progress at a CAGR of 3.80% over the period from 2016 to 2024 and reach a value of US$235 mn by the end of the forecast period. In terms of shipment volume, the market is likely to touch 1,619 mn units mark by 2024. Thanks to the rising utilization of PET in the manufacturing of pharmaceutical bottles, fueled by its atmosphere barrier properties, the PET segment is likely to remain witnessing a higher growth than other material type segments over the next few years, reports the research study. The report further provides a comprehensive evaluation of the application areas of pharmaceutical bottles in Spain. According to the study, pharmaceutical bottles are predominantly utilized in liquids, E-liquid, droppers, oral care products, and topical medication in this country. Oral care products, among all, have been exhibiting a greater demand for pharmaceutical bottles. It held a share of nearly 36% in the total demand for pharmaceutical bottles in Spain in 2016. Analysts predict the segment will demonstrate a significant incremental performance in terms of the growth rate as well as the market share throughout the forecast period. Topical medication, amongst others, is expected to witness a considerable rise in the years to come due to the design competence of pharmaceutical bottles that offer a convenient and less messy dispensing of lotions and semi-solid contents. “The advancements in the drug delivery formats applicable in the medical and healthcare industry are having the most prominent influence on the market for pharmaceutical bottles in Spain,” states the author of the study. Plastic-based pharmaceutical bottles are the latest trend in the Spain pharmaceutical market. 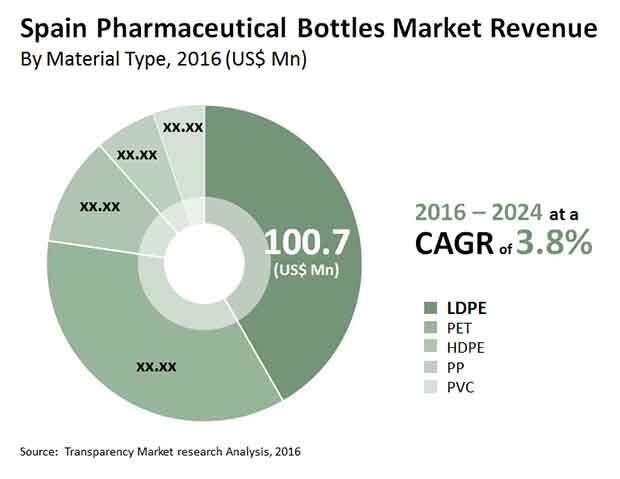 The availability of relatively cheaper polymers in abundance has brought the focus of manufacturers towards producing pharmaceutical bottles from plastic. According to researchers, this trend will shape the future of this market over the forthcoming years. On the other hand, the rising preference for flexible packaging formats, especially blisters, and the advent of eco-friendly biomaterials-based bottles as an alternative to the pharmaceutical bottles are likely to reflect negatively to the demand for pharmaceutical bottles in Spain to some extent in the years to come, notes the study.